Bermuda Maritime Museum is located at the Royal Naval Dockyard, in Sandys Parish. It's housed within a large fortress called The Keep that was originally built to protect the dockyard. The fort area covers a 10-acres of land with 30-foot high walls and is the largest fort in Bermuda. The museum was officially opened by Queen Elizabeth II in 1975. It's dedicated to Bermuda's rich maritime history and presents Bermuda's some of the most extensive artifact collections and historic exhibits. UPDATE: Since December 2009, BMM is now The National Museum of Bermuda after additional buildings and fortifications were added. Check out the above link for the enhancements, new exhibits and collections that have been added other than the already existing ones that I have mentioned below. You'll see a 3-meter high statue of King Neptune as you enter the parade ground through the entrance. This has been rebuilt in limestone from a figure that was recovered from the shipwreck HMS Irresistible that sunk in 1891. The six buildings where the museum's exhibits are housed were built between 1837-1852. In the Queen’s Exhibition Hall of the museum, 4860 barrels of gunpowder were once stored. Today it exhibits Bermuda traditions such as whaling and piloting, and the story of Bermuda sloops, flying boats, and cruise ships like the Queen of Bermuda. The building’s floor is made of non-sparking bitumen. In the facing Forster Cooper Building located just north of the Keep Pond, the Royal Navy of Bermuda is showcased. Exhibits describe the creation of Royal Naval Dockyard, including the story of its convict laborers and the lives of the Royal Navy captains and crews who lived here. You will also see collections of over 2000 rare and antique bottles found around the island. Next to it is the Shell House where the exhibit "Isle of Devils" provides information about the treacherous reefs in Bermuda waters and explains why the early navigators gave such dreaded name (Isle of Devils) to this island. Some of the most famous exhibits of the Bermuda Maritime Museum are housed in Shifting House. This section was opened in 1979. Here you can see rare collection of items like gold bars, pottery, jewelry, silver coins, and many other artifacts that were recovered from the ships wrecked during 16th and 17th century. You will see exhibits of Sea Venture, Sir George Somers's ship that wrecked at a reef near Bermuda in 1609, which led to the first settlement in the island. However, most of the visitors come to Shifting House to take a look at the Pectoral Cross that Teddy Tucker had recovered from a wreck in 1955. A little about my favorite topic, the pectoral cross that you will see at Bermuda Maritime Museum. We were very fortunate to meet with Teddy Tucker, the legendary scuba diver in Bermuda who collected priceless treasures from the shipwrecks during his lifetime. Over long absorbing hours, we heard many fascinating shipwreck stories from him and his wife. Teddy made a significant find in 1955 when he discovered the wreck of the San Antonio, a Spanish vessel that sunk after hitting the coast of Bermuda in a violent storm in 1621. 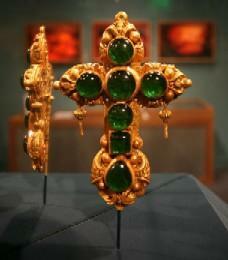 One of the great treasures of this find was the Pectoral Cross. But it was stolen in 1975 just before Queen Elizabeth-II officially opened the Bermuda Maritime Museum. The original cross has not been recovered as of today, and Teddy himself is awestruck with its mysterious disappearance. The priceless original cross was replaced by a fake. Other great exhibits include the collection of fine boats in the Boat Loft. Another area, The Age of Discovery exhibits the discovery of the new world by Christopher Columbus. The exhibit Pillars of the Bridge depicts the establishment of the US naval base in Bermuda. 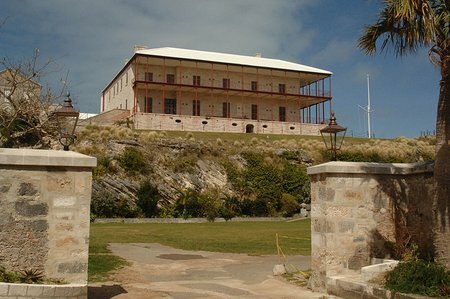 Commissioner's House is a magnificent structure inside the fort and is part of Bermuda Maritime Museum. Once the home of the Dockyard Commissioner, it is the oldest cast-iron residence building in the world and considered to be Bermuda's one of the most important buildings. Commissioner's House has been now restored from near dereliction. This grand 1820s Georgian house presents an array of new exhibits and special collections. In the ground floor where the walls are made of limestone, you will find Bermuda's contribution to World War-I, with a focus on local defense used, armed forces, and war veterans. Two upper floors made of mahogany moldings, feature rare Bermuda coin, map, archival, and art collections. It also depicts local slavery, culture, and foreign military influences. You get a spectacular view of the Dockyards from the Commissioner's House at Bermuda Maritime Museum. To know how exclusive homes are being built for the Bermuda Longtail birds within the BMM complex, check out Bermuda Longtails. There is another top attraction within the same complex - The Dolphin Quest that features interactive programs with Dolphins. While there are separate charges for the interactive dolphin experience, the museum admission fee allows free entry to the Dolphin center for watching the dolphin shows. The Keep Fort, Royal Naval Dockyard complex, Ireland Island, Sandys Parish. Check out Royal Naval Dockyard map to see the location of Bermuda Maritime Museum within the dockyard. Ferries from the City of Hamilton stop at Ireland Island, at the western end of Bermuda. They ply every hour between 7am-6pm. Buses (#7 or #8) leave the City of Hamilton for the Royal Naval Dockyard (bus #7 and #8) from Monday through Saturday about every 15/20 minutes. The bus trip takes about 1 hour. 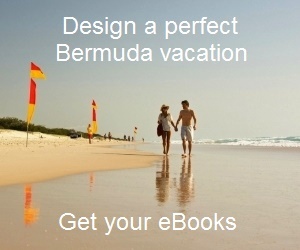 1) Check out Bermuda Museums for museums & historical buildings in Bermuda. 2) Check out Kings Wharf (Royal Naval Dockyard) to know about all the attractions and activities in the Dockyard. 4) Check out Sandys Parish to know about other great attractions in the parish.